The Eye Doctors, P.C. has been a leading provider of optometry services and vision care products in the Sioux Empire for more than 20 years, and we want to help you achieve and maintain clear vision for years to come. If you are already patient at our clinic, we invite you to look around our website and see what it has to offer. You can now schedule appointments online, find descriptions of our offered services, and learn helpful tips about how best to care for your eyes. If we have not yet had the pleasure of meeting you, please stop by our clinic and meet our friendly and knowledgeable staff. We offer convenient hours and always welcome new patients. Our mission is to enhance our patients' lives by providing comprehensive eye health evaluations and corrective vision options. By utilizing advanced technology, as well as years of optometric experience, our knowledgeable and friendly staff is dedicated to educating patients about their vision needs while providing quality craftsmanship with the finest materials for corrective products. 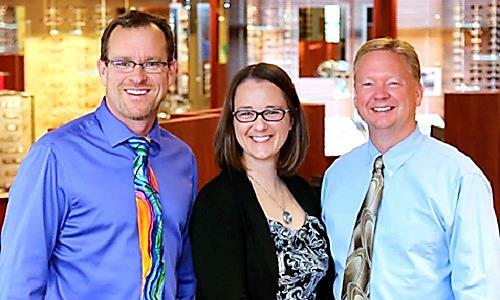 We have a history of dedication to meeting the eye care needs of our community. We believe in building relationships through honest assessments and genuine compassion. Our emphasis on a quality, technology-drive exam enriches the lives of our patients by optimizing their visual performance. Our knowledgeable staff takes pride in education each individual about the products that will help maintain the health of his or her vision. We excel at providing personalized styling options from our unique eye wear collections. Our willingness to go the extra mile for our patients creates a friendly experience that encourages long-term relationships. By encouraging these relationships, we inspire our community to stand behind us.